Today was a lazy day. I slept in. It rained hard. I stayed in bed. Eventually I got out of bed and surfed the net and painted the power weapon on the Bezerker Champion. I left that until today, after painting a little bit last night. I’d paint a bit, then watch an episode or two of Battlestar Galactica on DVD then paint some more. I finished up the skulls and armor for the most point. I painted on the purple flames. I even did the pale blue skin, which didn’t go perfectly smooth, but came out well enough. I touched up a bit and the last major thing to paint on the models was the Aspiring Champions power weapon. I’d used up good power weapon colors of blue and purple already on these models, so I opted for a bit of mint/jady green. I used about a half dozen different paints all made by Vallejo or GW and blended and mixed them on a wet palette. Not my best work but good enough and unique enough to stand out on the battlefield or in the miniature display case. Now the biggest problem facing me as far as completing these models, is the fancy resin bases. The two on the left will be easy, they just have some dirt and skulls, but the other three. 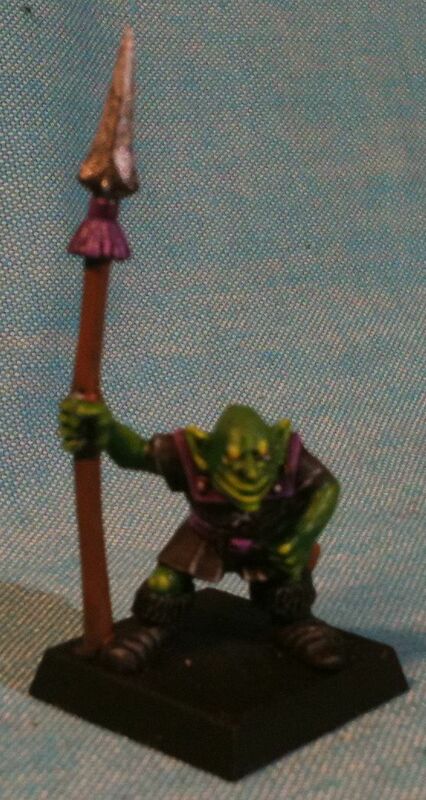 That will require some highlighting and detail work all their own. Maybe I’ll be able to finish them tomorrow, but probably not after how little I accomplished today. So having finished off two terrain tiles, I cleaned up my painting area pretty good, put away most of the materials and bits that were littering the floor and set about getting some models finished an off my painting table. The first batch I decided to finished were mostly already painted. The batch consisted of some new Nurgle demons that I’d been painting on the side and experimenting on, also added to the queue was an old plastic goblin spearman. This model had a bent spear and hadn’t been seen for years having gotten stuck to some foam. I fixed the spear and gave the model an average actually better than average paintjob, plus affixed a shield to him. 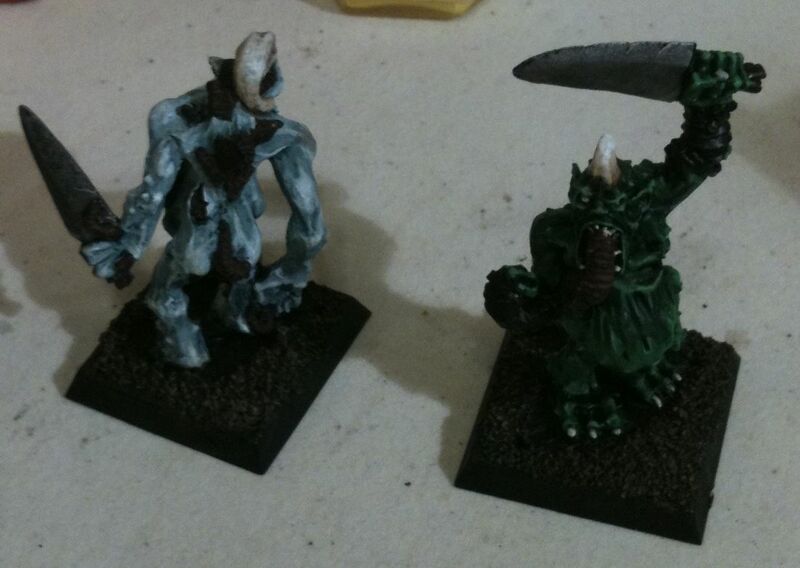 The two models I finished first were too old mid 90s Diseased Sons character models. 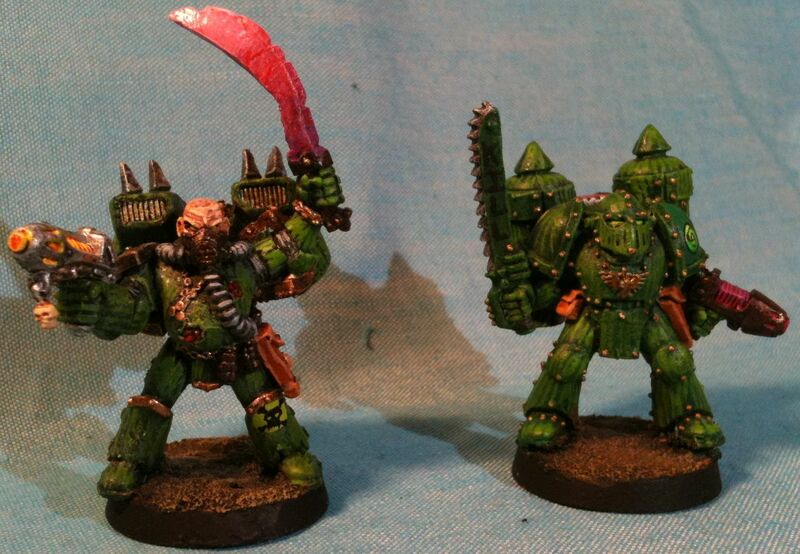 Both were converted to have jump packs, one an old Ork jump pack and the other a converted metal loyalist jump pack. 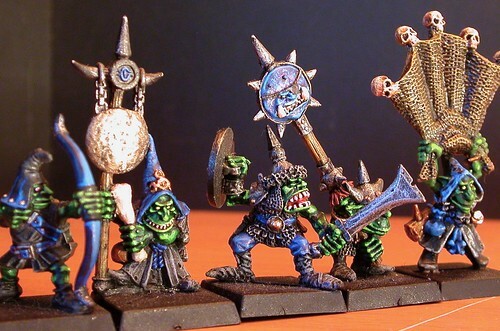 Back in the day during 1st and 2nd edition jump pack characters were all the rage. They usually had conversion or possibly even displacer fields which made them tough to kill. Now-a-days models seem to go about in rhinos and land raiders as it is safer and the models are cheaper and readily available. 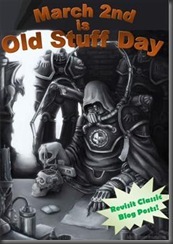 The one with no helmet is Oderous the Unclean he was the lord/leader in the early days of the Diseased Sons. The other model which is in Crusader Armor was usually used as a lieutenant, sometimes both would be in an army list. He only has a chainsword whereas Oderous usually used a Plague Sword or sometimes a Deamon Weapon when I went a bit over the top. 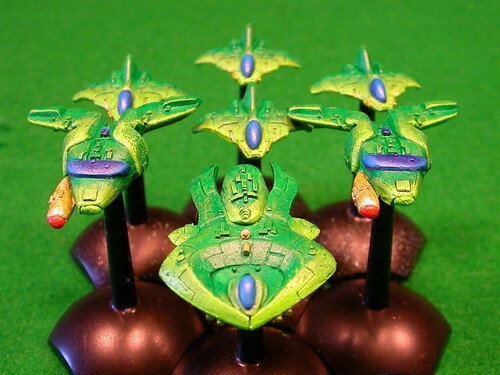 These models were considered pretty damn well painted back in 96 or 97. I learned that once sealed you can’t use washes much on old minis so when I update one, I generally just add highlights or paint in lowlights. These models got the tiny line treatment and because they have sentimental value and I wasn’t in a hurry I touched up and improved a lot of things about the models, from Oderous’s face to the leather bits. This is the best these models have ever looked. I still don’t think they’ll see the tabletop much, I may make another lord with wings someday, but generally I try to keep costs down on my HQ and like everyone else stick them with a squad in a vehicle for safety. I was going to make some Nurgle Raptors and I’ll probably still do it someday, but first I think I’ll do Khorne Raptors it makes more sense tactically. I’m also trying not to buy stuff, but to complete a squad of 8 Khorne Raptors I may need another jump pack or two plus possibly legs… Though I think I’ll get buy it will be the Noisemarines which I’ll do someday too, that will require the buying of some more legs and torsos. 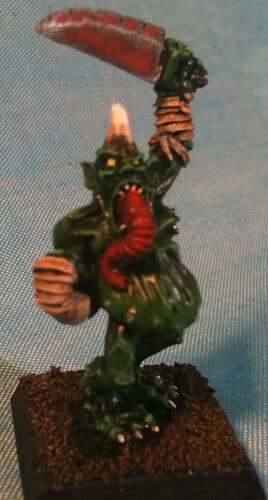 The models that I put a lot of work into, especially relative to their importance are the Nurgle demons. I don’t need more painted Nurgle demons, I can’t even use them in a Chaos Space Marine army currently. However I bought some both for fun and because I had a plan for hordes of Nurglings… After buying and assembling them they sat primed in a box for years so slowly I’m working through them. I think I have six more stands to go. I use Nurglines and Plaguebearers to try out new techniques and color combinations, sometimes I just use up paint on them left on my palette. These models were mostly finished prior to the terrain building period, but I still had enough bits undone to try some more stuff out. The blue grey skin may become a fixture of my Servants of Decay force. 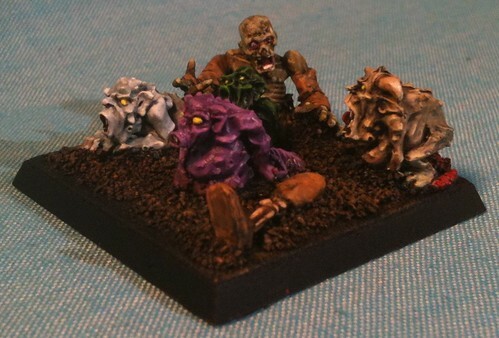 The Zombie on the Nurgling base was painted similar to how I did the sandbags with GW greens: Gretchin, Camo, and Rotting Flesh. Camo isn’t so important now that I have Gretchin green, it is probably better for zombies anyway. I used washes mostly Badaab Black and Devlan Mud but also probably Gryphonne Sepia. 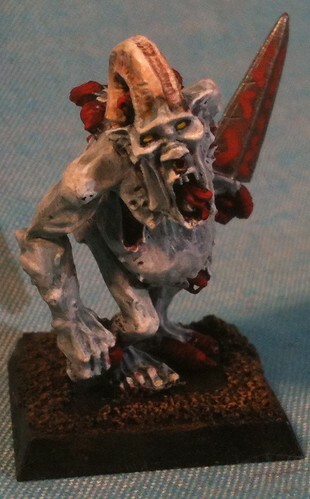 Most of my plague demons will look similar to this one, but I’ll try to streamline the technique some. The other thing I wanted to test was the new Reaper brand dark reds I bought. The plaguebearers especially the pale one had lots of exposed guts these got covered in Terracotta Clay, Bloodstain Red, and Clotted Red. Clotted Red is the big winner it covers well and is a nice dark red. The others are more brown, still useful but when trying to get say a squad done I’ll be keeping my red recipe as simple as possible. I will be painting some Khorne worshiping models and I don’t want them wearing no sissy red. GW reds especially the new ones tend towards orange. I don’t want that. I’m going to Vancouver Island for a few days, see the family, watch the World Wup final with my cousin from Austria. So I’m trying to get these models done before I go. I tried finishing them last night but it is getting hot in Vancouver even late into the night. The reds are drying right now, soon I’ll give them some washes and some highlights with GW reds, I have plenty of those then finish off their weapons and the rags on the one model and they’ll be done. I tried to use my Awesome Paint Job.com Drying Blood wash but despite shaking regularly it separates and then gums up its dispenser. I ended up mixing a bit of the thick stuff with water and using that. I bought three of these washes and the only one that has worked is well I used an excessive amount of Cool Gray again because it gummed up and came out in a big blurt. I’ve taken to poking a needle in the Reaper and these pots, Vallejo gives me less trouble but it separates too, it just mixes back together better. I have various red washes, glazes, and inks mostly old GW stuff, but you can buy artist ink. I’ve been buying some of that mostly orange, sepia, and flesh. I have this olive green one too, but I haven’t tried it. Oh well maybe on the next batch of Nurglings. I’m using pigment mixed with water and my beloved old Rust Brown Ink to make the rust on the Plaguebearers blades. I’ll also probably mix in some orange paint as I often do two or three tones of rust to get an interest effect. My mom just called so I have to wrap up the miniatures and this post and make sure I don’t miss the 5 o’clock ferry. It is only 2:30 but I also have to pack and take out the garbage… I wish I would have done the laundry I guess yesterday, but I guess it will just wait until I return. I’m going to try the Krylon Matte sealant on these models. 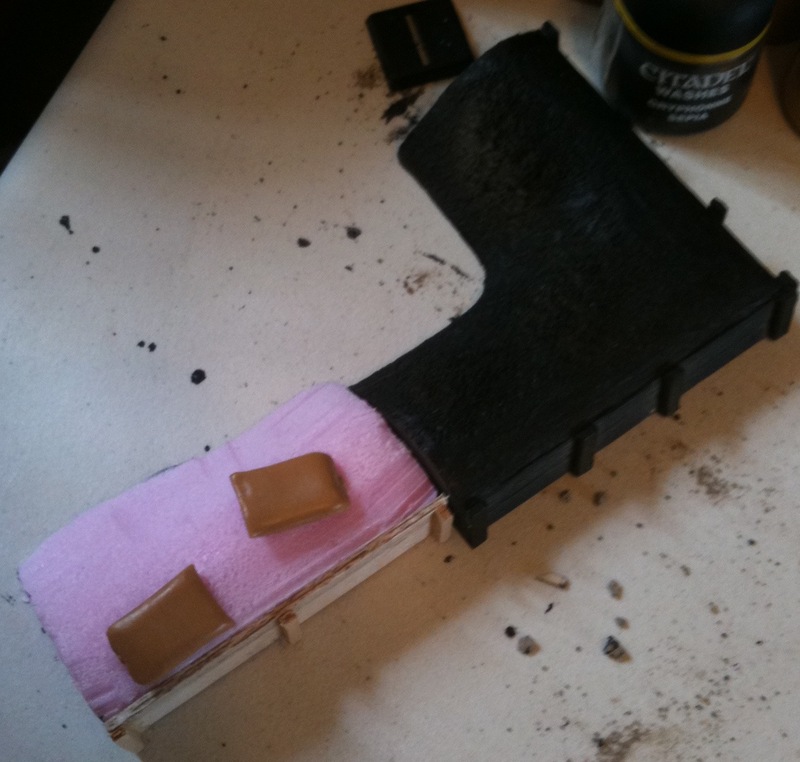 I used it on some of my scatter terrain, nothing bad happened, but we gotta wait and see how it wears, I don’t play much, but I do use my models in games occasionally. 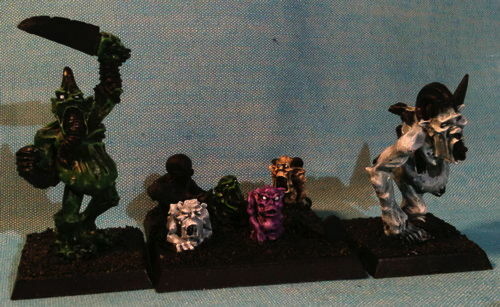 When I get back from Vancouver Island I’ll work on these four tester models and maybe yet more Nurgle demons. 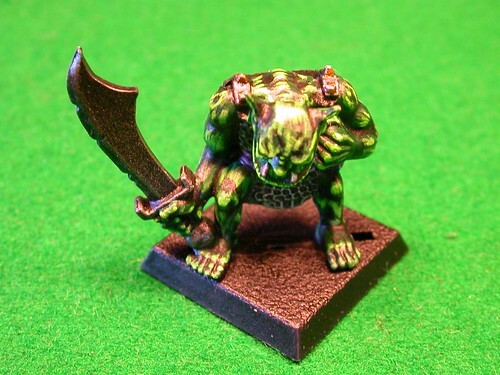 Contrary to what you may have read elsewhere online, I do know how to paint Nurgle models. So despite today being a big sports day and despite it possibly being the best UFC card ever, I walked home and immediately started working on finishing up the models I started assembling today. These are the models I mentioned in my previous post. From right to left they are an all metal GW plaguebearer, a Foundry 25mm British/Canadian WW1 Rifleman, an old OOP plastic Khorne Bezerker, an almost as old plastic Necromunda Orlock, a hodgepodge of a Plaguemarine armed with a melta gun, and finally, another kit bash of a Chaos Space Marine armed with a heavy bolter. 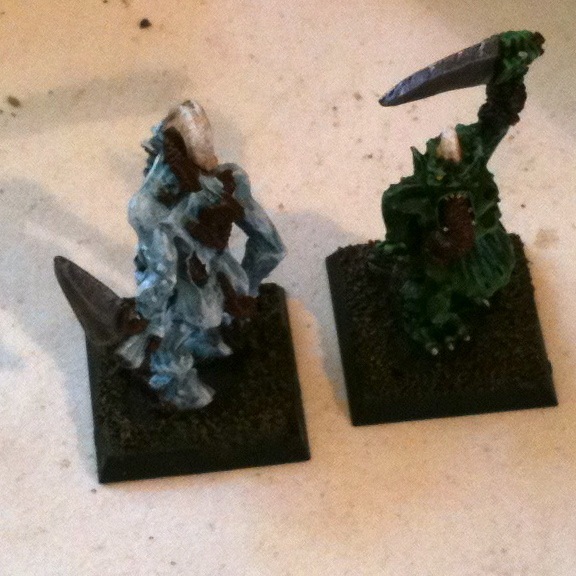 These models will be part of my Diseased Sons, Nefarious Fire, or Servants of Decay armies/warbands. The plaguebearer is mainly for fun and the WW1 model is to test a paint scheme for the Canadian Corps. The rifleman is noticeably smaller than more recent models, even the Orlock looks small but that is actually correctly scaled next to a Chaos Space Marine. The Necromunda fig is so old, it hasn’t seen the light of day since I lived in Yellowknife. 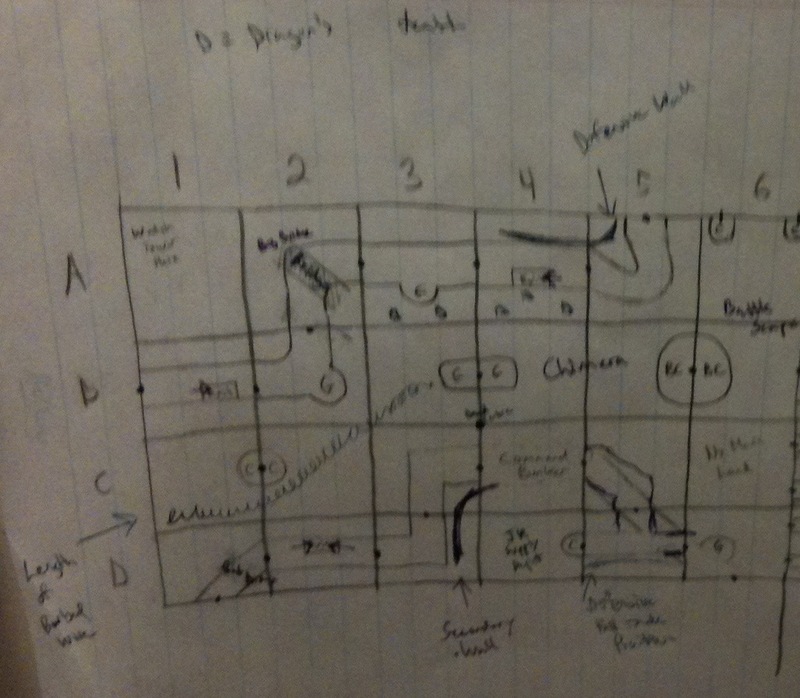 That was during the second edition of Warhammer 40,000. I’m surprised I even remembered it was an Orlock. The Goliath gangers may look more chaotic, but I think the Orlock will allow me to test my brown, black, and purple paint scheme better. Some of the knifes got broken off the Goliaths but I repaired them. There are basically two poses per gang with a variety of guns. 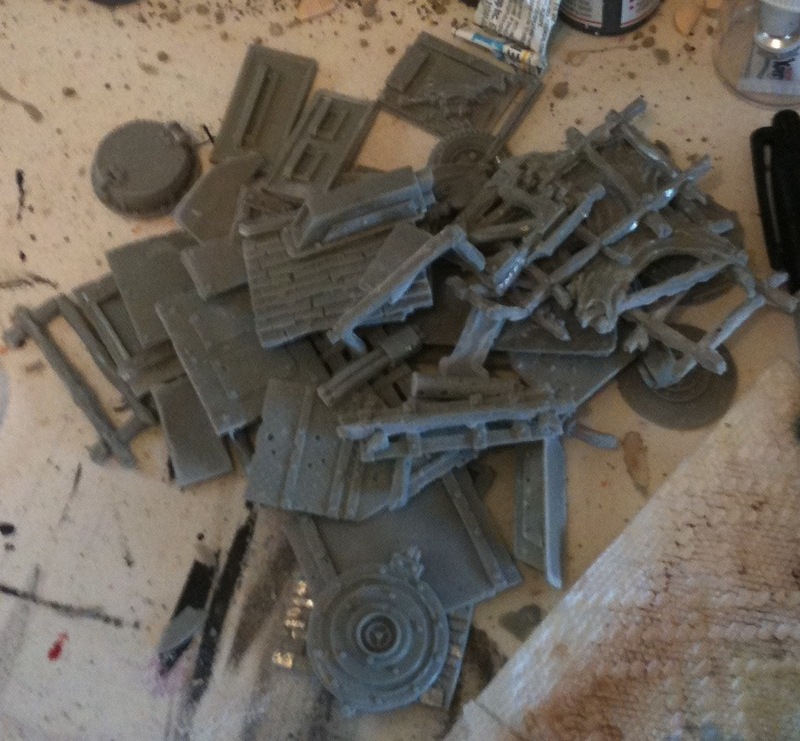 There were spare guns and lord knows I have bits, the problem is most of my bits are for space marines. 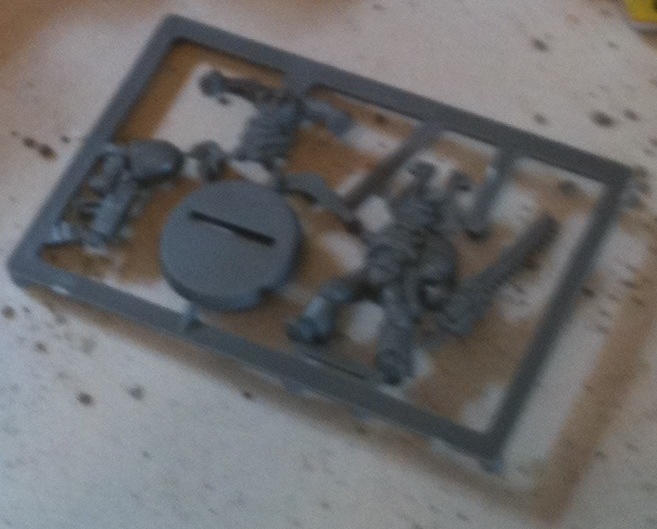 My vaunted bit box is running out of Chaos Space Marine legs, even torsos. 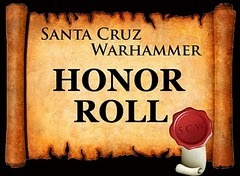 I was also out of backpacks of the non-Khorne variety. The only plastic chaos backpacks I could turn up were from second or first edition. I’ve converted so many loyalists to the dark side I’ve used up most of my backpacks and torsos. I gotta stop buying loyalists… Of course I’m trying not to buy any models, I have plenty of one piece metal chaos space marines, including a pile of Bezerkers. I also am running out of suitably Nurgly heads. One of the most recent, in fact the most recent chaos kits I’ve bought is the possessed so those bits are getting pressed into service. One thing I have plenty of is shoulder pads, if you like your shoulder pads fancy. I have piles of metal Deathguard ones, so I keep using about one a mini when I do a Nurgle guy. I used one of the new Space Wolf shoulder pads on the Heavy Bolter guy. His legs and torso are pretty plane Jane, but I made sure to get his gun assembled well, though it too two tries. His head is a loyalist head, from the Black Templars upgrade sprue I think, I like heads with targeters for my heavy weapons guys.